In many parts of the world, for instance sub-Saharan Africa, rural India, the desert parts of latin America and even in China, there is a push to use solar cooking to reduce the amount of wood and charcoal burning, to reduce local environmental air pollution and to increase public safety. Wood gatherers, often children and women, are more prone to attack as they range further from their home base in search of scarce resources. Large stretches of the world are being deforested, in part, by people needing fuel for cooking. Useful for local culinary customs, which involve cooking grain porridges, boiling vegetables, roasting meat, possibly baking bread. Made of cheap (for my budget and theirs), easily repairable, replaceable, and sustainable materials. Hopefully, capable of being mass produced cheaply, if found to be useful and effective. 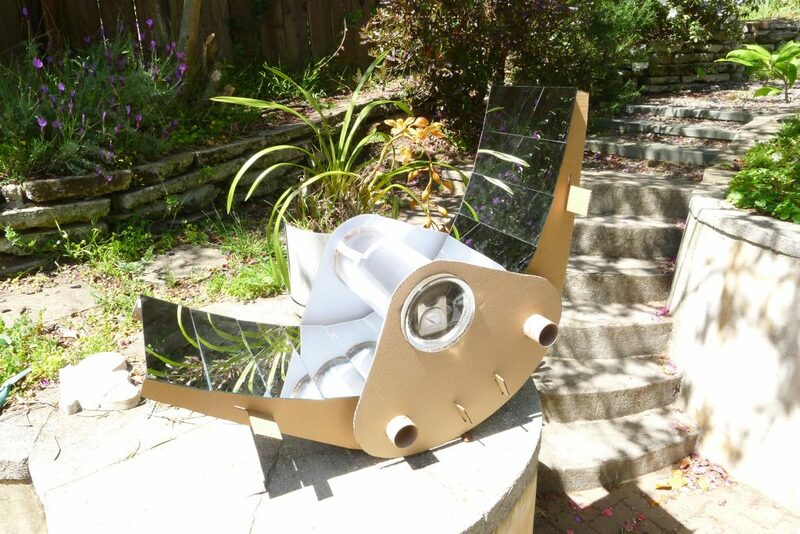 Solar cooking is simple from a scientific point of view, and also quite intuitive, as anyone knows who has gotten into a hot car on a sunny day. Incoming solar radiation at sea level embodies as much as 100 Watts of power per square foot, mostly in the form of visible light. If the light is absorbed by a dark surface, the surface will heat up, and the heat will tend to be radiated away as thermal radiation. If the surface is surrounded by glass, however, which is largely transparent to light but largely opaque to thermal radiation, then the heat is trapped – this is known as the greenhouse effect. Using mirrors or lenses, more solar energy can be focused on a small area, increasing the temperature. Increase the heat enough, and you have a cooker. My design was based in part from what materials I found readily, and what my tools and crafting abilities were capable of. The design also evolved with step-by-step experimentation. I determined early on that the cooker needed to incorporate a glass shell so as to use the greenhouse effect. I was able to find an inexpensive, cylindrical glass vase to use as my shell; it’s shape determined that I would create an oven rather than a ‘stovetop’ style cooker. The design I settled upon had a parabolic reflector wrapped around the cylinder, held in place with a structural frame made of thin sheets that could be knocked down for ease of transportation. The prototype used cardboard, with Masonite or a similar artificial wood panel in mind for a final version. The pieces knock down to a (mostly) flat bundle, small enough to fit within the length and width of a typical suitcase. The absorber plate which lined the inside of the glass cyliner was galvanized sheet metal with barbecue grade flat black paint as the finish. Some hemp rope, scavenged from the garage, was used for gaskets. Some quick experimentation with aluminum foil and cookie sheets as reflectors convinced me to use real mirrors – true specular reflectors seemed to be called for. The first test of the prototype reached a temperature of 235 degrees – not great but good enough to bake cookies. Then disaster: I was showing the cooker off on Earthday and the wind blew it over and broke it into shards…Oh, well, scientific progress goes boink. It was only a prototype, and proved to be less effective than desired, besides being too fragile, and probably too expensive. It was lovely piece of design, but back to the drawing board!